(EN) In an unlikely borough of London, rarely associated with the creative scene, fashion director Stephen Mann has found his home in a Victorian building along with his girlfriend, Genesta. During an intimate chat, he professes his fascination with Dieter Rams and walks us through his path into the menswear world. (EN) Haringey used to have a reputation for being pretty hairy. Over the years, a stream of coverage of gang shootings, public service failings and kids looting trainers at JD during the riots just added fuel to the fire. Matters weren’t helped by the almost tectonic incision that divides the borough in two. On the west side of the line, you have Highgate and Muswell Hill. These neighborhoods, two of the wealthiest in London, are rarely associated with the rest of Haringey. To their east are a series of indiscriminate, hard up high streets like that of Bounds Green. And on the far east is Tottenham which, although currently undergoing a one-billion pound regeneration programme, is still one of the poorest towns in the UK and the primary source of the borough’s bad publicity. (EN) Despite its public image, an exodus of young renters and first time buyers are on their way up the A10 from Dalston. For the majority, the imagined threat of violent crime is far outweighed by the very real threat of money-grabbing landlords and nonsensical house prices. Stephen and his girlfriend Genesta moved to Haringey six years ago, buying a two-bedroomed house somewhere between Tottenham and Seven Sisters two years ago. (EN) They share the house with their two dogs George and Frank and until recently, a team of burly builders. “When we moved in, it had no floor. It had been completely gutted. There was literally just the dirt beneath our feet,” Stephen says. “If I were to advise anyone to do a project like this, I’d say ‘Get yourself an architect and a project manager’. I wouldn’t say ‘Do it yourself, it’s a laugh,’ because it’s not. It’s a pain in the arse,” he adds, and coming from the mild-mannered Stephen, it seems advice worth taking. (EN) On the outside, it’s a typical Victorian terrace. Inside, it’s a different story. 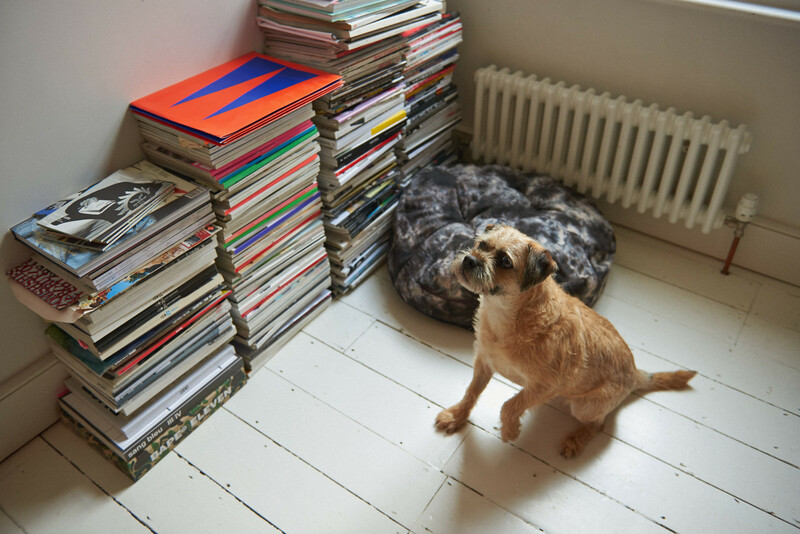 “We wanted something clean and not too fussy, somewhere we could relax without being distracted by too much clutter,” says Genesta, who runs a dog biscuit and accessory company called Fetch and Follow. It’s an understatement. Everything they own is concealed within bespoke storage systems. Any piece of furniture or fitting they have conceded to and let into their home has not been by accident. The sofa, the mug, the shelves… they’re all so beautiful and functional, they make you feel guilty for not trying hard enough. The only things on show in the house are Stephen’s photography books and, as the main inspiration for his work, even they have a legitimate purpose. You wonder what Stephen and Genesta do when they get a chintzy picture frame for Christmas. Straight in the loft, probably, or the bin. (EN) Consistency, it seems, is important to this couple. The imposing wooden kitchen unit, wardrobe and bathroom fittings were designed by Dean Edmonds. Nearly everything else was made by Vitsoe, the company behind Dieter Rams’ designs. “I first encountered Vitsoe at the Dieter Rams exhibition at the Design Museum in 2009 and started collecting vintage Braun and Vitsoe.” The 606 shelving system is installed in the lounge, kitchen, spare room and bedroom, then there are the 620 chairs, the 621 side tables and the 610 wall panel system in the hall. Vitsoe’s small range of multi-purpose products were originally designed in opposition to planned obsolescence and trends. They were, and still are, built to last. (EN) Stephen studied illustration at university, only moving into fashion when he left, and for someone relatively young with no experience, his career has taken a sharp trajectory. His first big break came four years ago – just three years after graduating – with Missoni when Angela Missoni hired him to style their menswear shows. “My career is a bit topsy turvy. When I first met with Angela, I was neither the safe or the easy choice: I was somewhat unknown. To have that trust put in me by Angela was a really important moment in my career.” The risk paid off and Stephen has been working with the brand ever since as a menswear consultant, teaming up with Viviane Sassen this year for their AW14 Men’s campaign. (EN) … to Stephen Mann and Genesta Gunn for showing us around their home and sharing their thoughts and ideas with us. Curious about more creatives in London? Visit their homes on Freunde von Freunden.